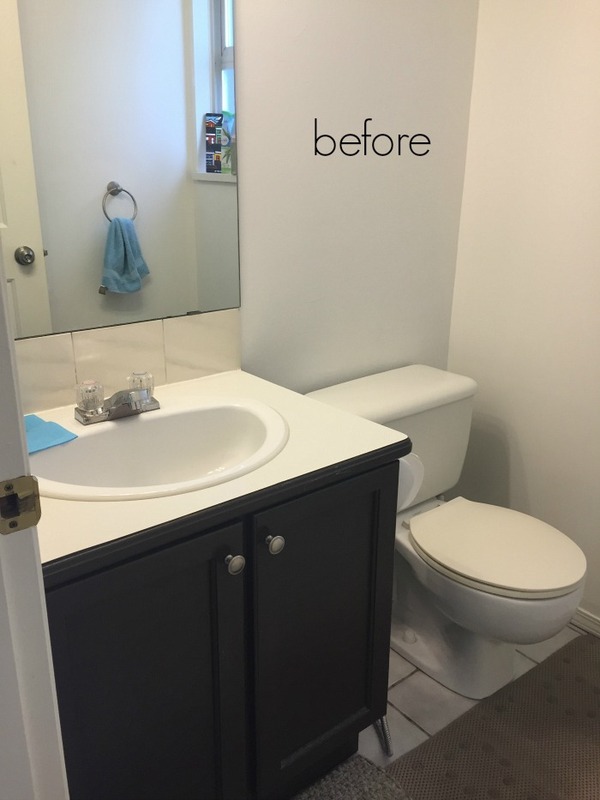 This is a before and after of my black, white and french bathroom makeover. This 80s bathroom was in desperate need of a makeover as you can tell by the photo. Of course I wanted to make it French but I decided to mix things up a bit this time and keep the fixtures modern. It shows how you can mix modern and traditional or vintage together and even mix golds and silvers together. There’s a lot of detail in this little room but it’s still a very simple overall design. 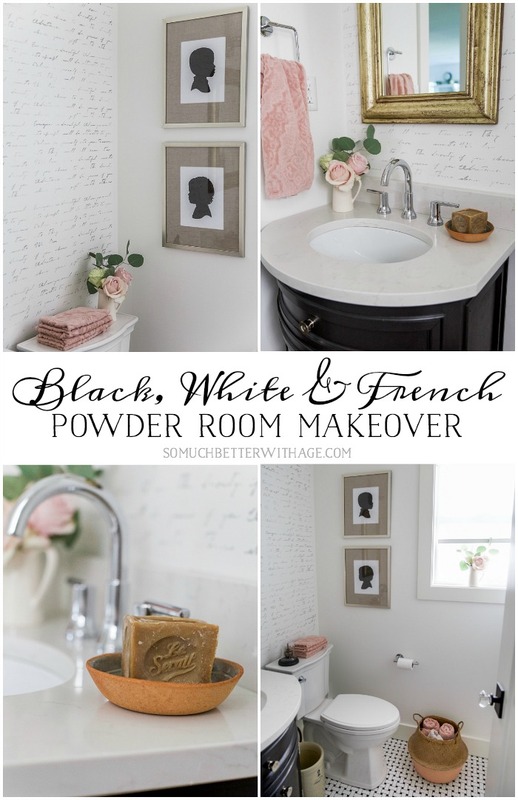 I can’t wait to show you my black, white and French powder room! 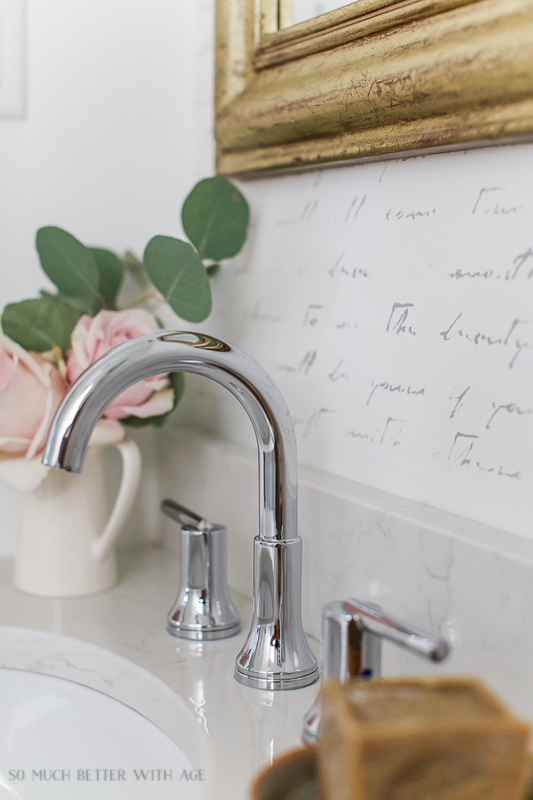 Decorating a small powder room is fun. It’s a little space to decorate how you like. I stencilled this one wall in here on a whim. While the kids were watching a movie, I did this whole wall in about an hour with some grey paint, a stencilling brush and this stencil from Fusion Mineral Paint called Illegible Script. Anything would be an improvement from this before photo! 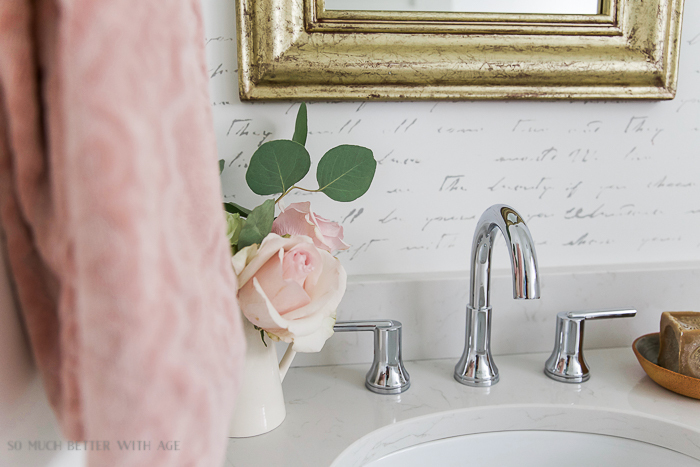 The door holds the one glass knob in my entire house…I had to have at least one and the powder room was the perfect place for it. 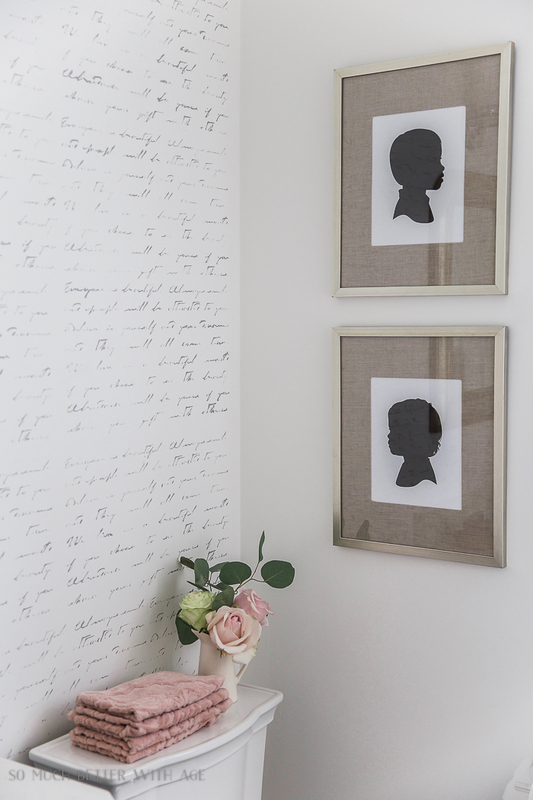 The silhouettes were made of my kids when they were both 18 months old and I had them framed in gold frames. I found this vanity at the Restoration Hardware Outlet store. 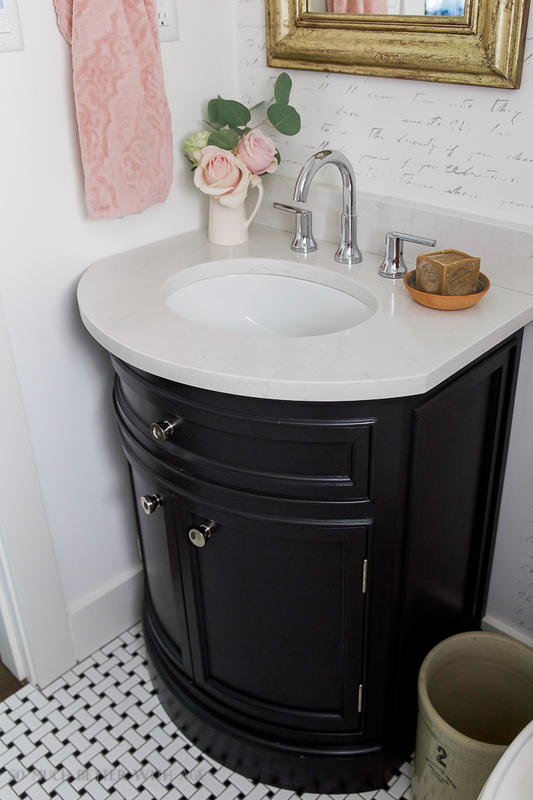 It was chipped in a few places so I painted it in this charcoal grey and had a quartz countertop made for the top that matches the kitchen. The faucet, towel bar and toilet paper holder are from Delta Faucets Trinsic line. 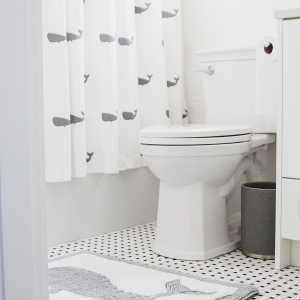 I used the same black and white basketweave tile that was used in the kids’ bathroom. The crock is now pretty garbage can. I love the mix of old with new and gold with silver. And of course black and white. There are so many elements but it’s still so classic. 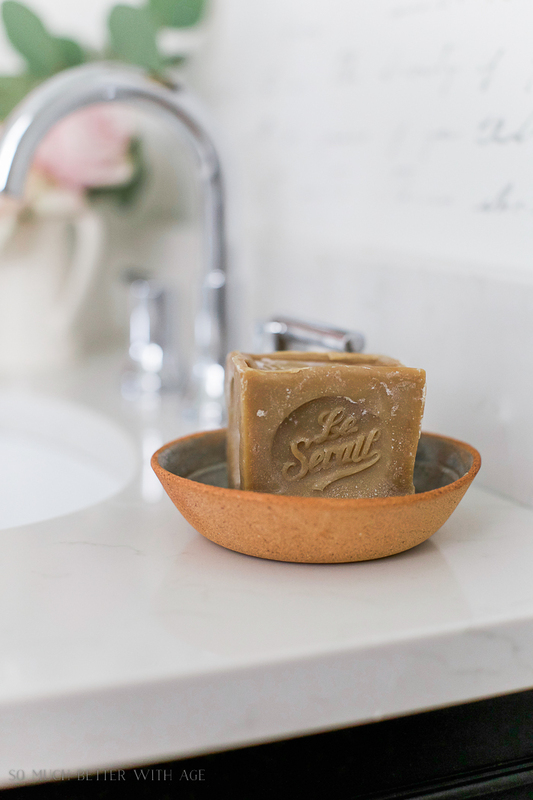 This soap bar and little pottery dish I brought back from France last year. I wish I brought back more of them! I’m so happy with the way this bathroom turned out. Beautiful transformation. 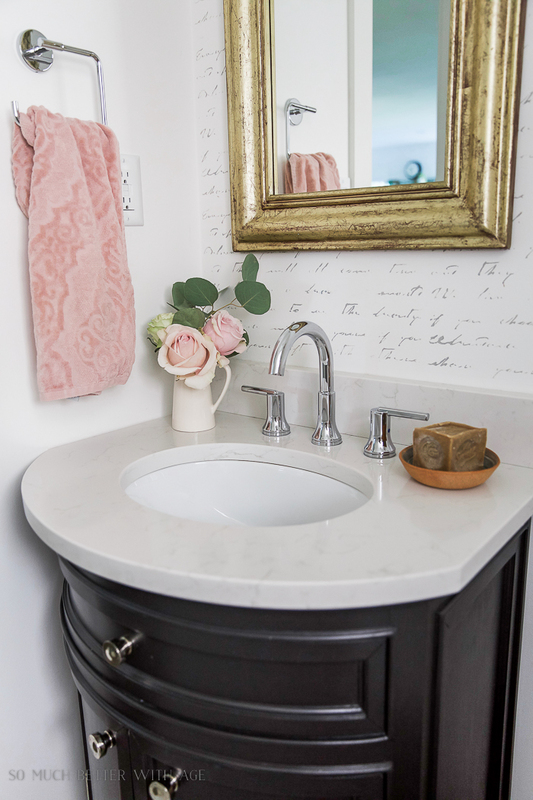 I love how your splashes of peach, the basket, soap, mirror frame. 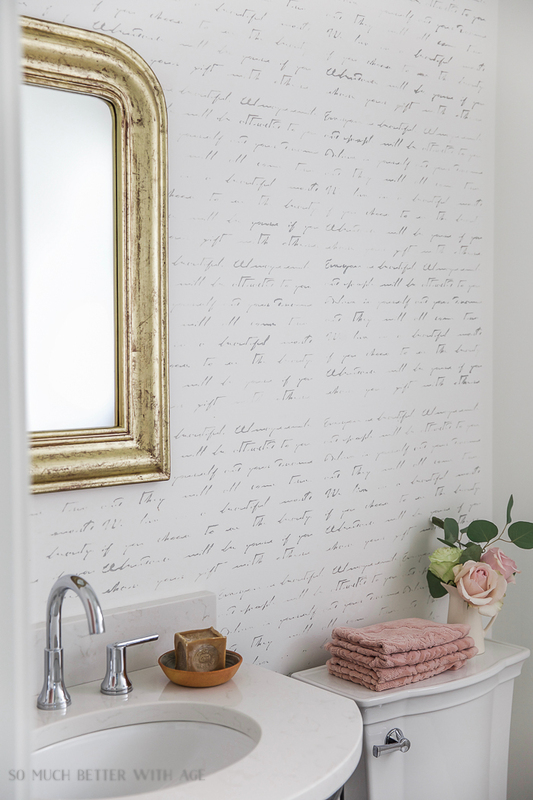 wallpaper , all come together to add color, texture, and interest to your bathroom. Great job and it gives me inspiration to change my small area up as well! Love your blogs! Beautiful, fresh and elegant! 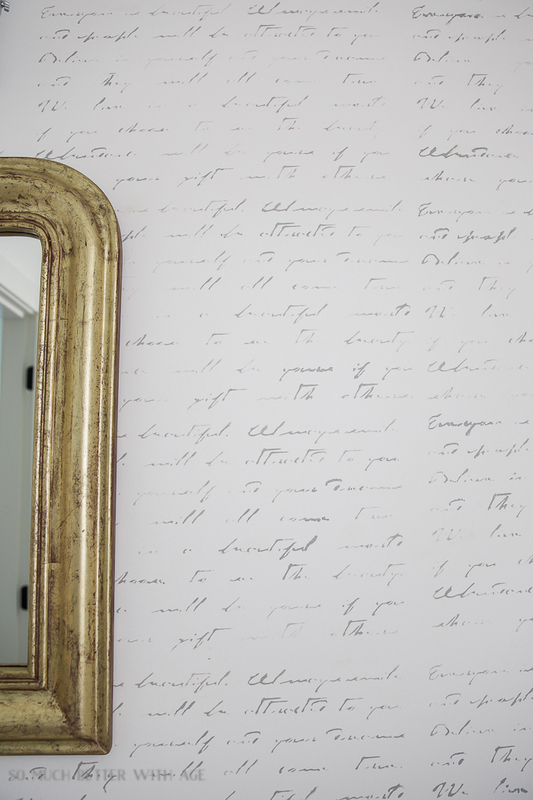 Love the stenciled wall. Very pretty! All the elements are different but still cohesive. You’re an inspiration! Awww, thanks so much, Nancy. 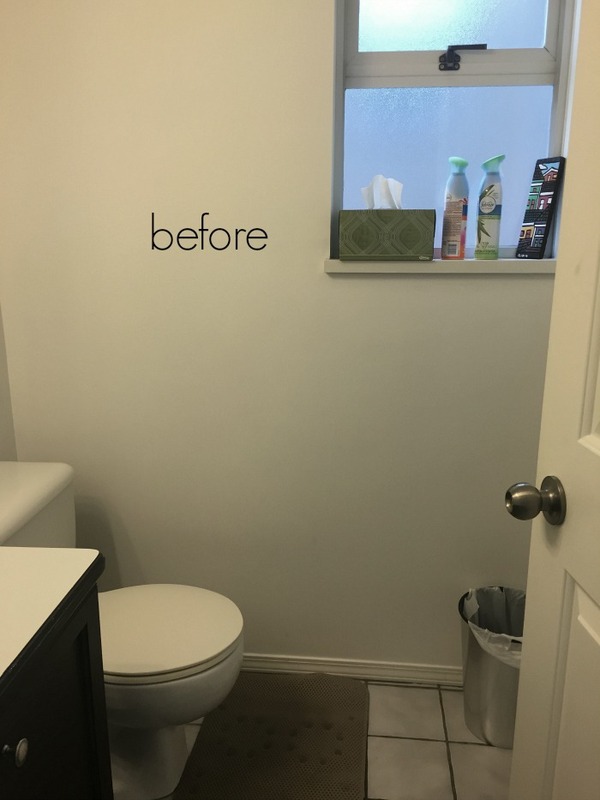 Your redone powder room is lovely. Can you tell me where you got the hardware for the door to the room? The black knob and backplate. It’s a beauty Jamie!! Cannot believe that you stenciled the wall on a whim. Gorgeous. And you transformed that vanity into one that’s even more pretty!! Fabulous job!!! It’s so beautiful! I absolutely love it. You’re beyond talented. Jamie! That stenciled wall is to die for! I love how you transformed this room. It’s a stunner! Looks lovely, i love the script, don’t get mad if i’m in there for i while, i’ll be reading your wall. lol!!! haha thanks so much, Marlene! 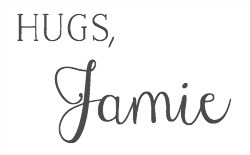 You always knock it out of the park Jamie and I LOVE what you did here! Aww, thanks Janet! Such a compliment coming from you. It’s gorgeous, Jamie. I love the wallpaper! Great job! Thanks so much, Suzy! It isn’t wallpaper though, it’s a stencil! hey girl- I just love your bathroom ! so pretty! The roses are beautiful ~ EVERYTHING ~ the wallpaper stunning. I love the entire project. Thank you so much, Rose! I love those tiles too. And the wallpaper isn’t wallpaper, it’s a stencil! 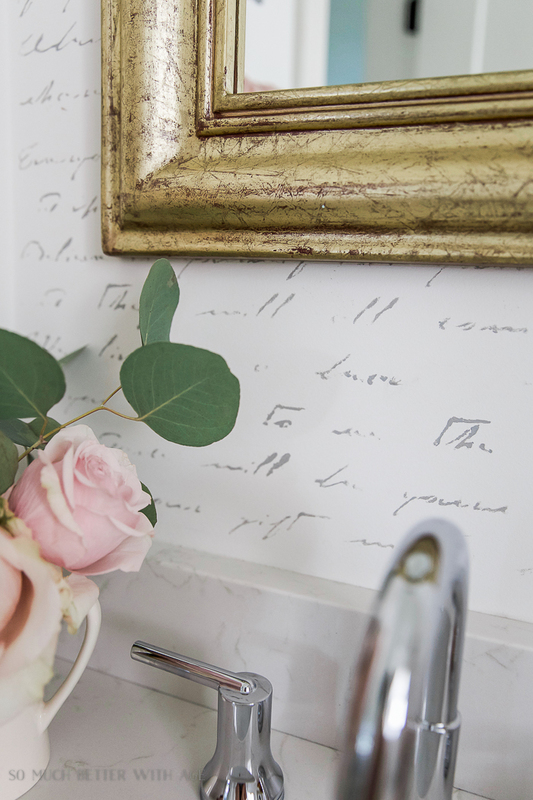 That stenciled wall is so pretty! 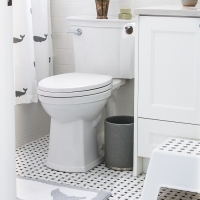 And I am loving the basketweave tile… what a beautiful makeover. I absolutely love the wall stencil. And all the pops of rose and gold are beautiful against the black and white. 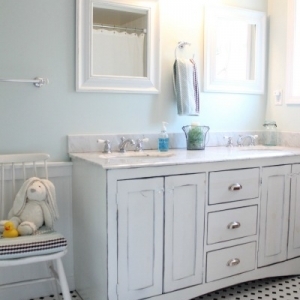 You make me want to consider this for our own powder room – which totally needs some love! Thanks so much, Kristin! I’m really loving it. Ooh…this is beautiful! Love how refreshed and chic it all is now Jamie. Pinning! Which size stencil did you use, the medium or large? I’m pretty sure it’s the large size! Good luck! What color paint did you use for the stencil? Gorgeous! Your makeover is beautiful. I love all of it down to the little rose pink details, everything is gorgeous. Pinning. Thank you so much for being here, Priyam! 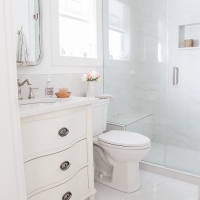 That’s a great post to learn how to makeover a bathroom. Good ideas to work on while transforming the space. What a beautiful makeover. I love the stenciled wall amazing how you did that in an hour it is gorgeous! Thank you for linking up to Talk of the Town you are my featured pick for next weeks party! Wow! I thought that stenciling was wallpaper! 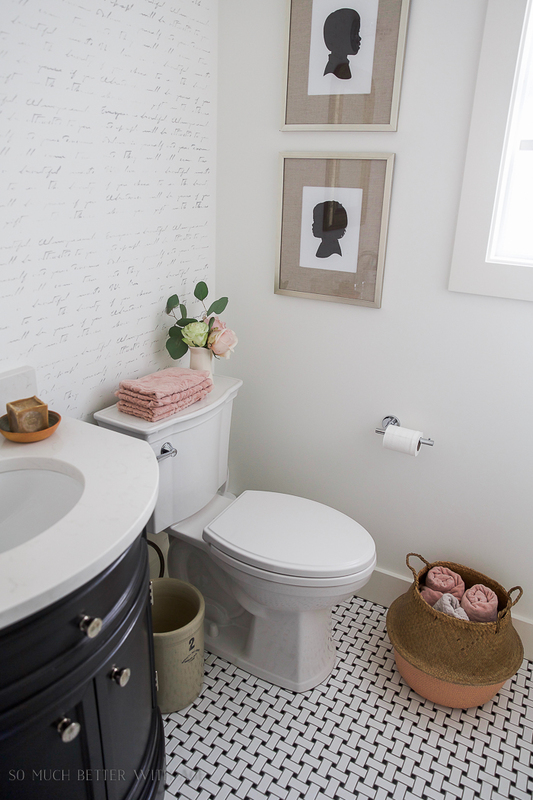 Love the basketweave tile with the stenciling! Great job, love this makeover! Thanks Angelina. I love that tile too. Wow! This is gorgeous. I love the transformation. 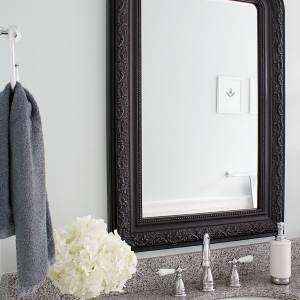 Your powder room turned out fantastically! What a transformation!!! 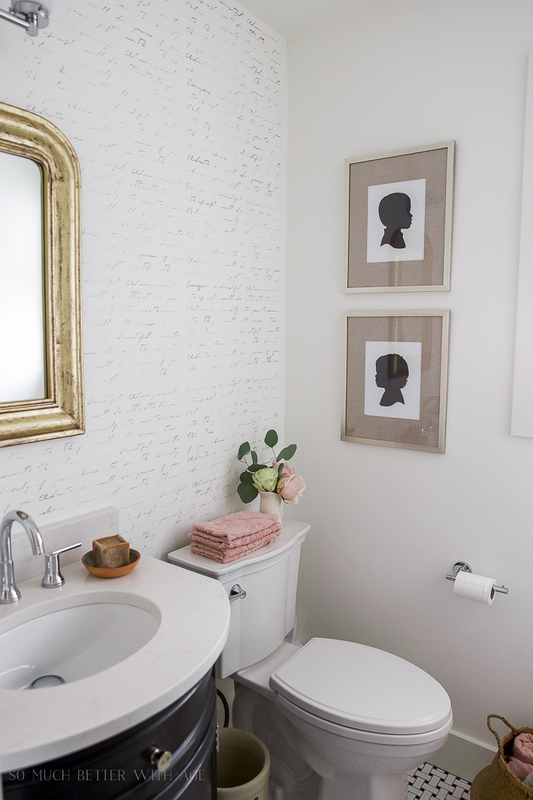 Love the script stenciling ~ I thought about doing something similar in our current bathroom. Lovely!!! Pinned a ton for you. Thanks Barb! I love how it turned out. I’m so inspired! It all comes together so well. The towels really set it off. Mind telling me where you got them? I got them at Home Sense here in Canada. 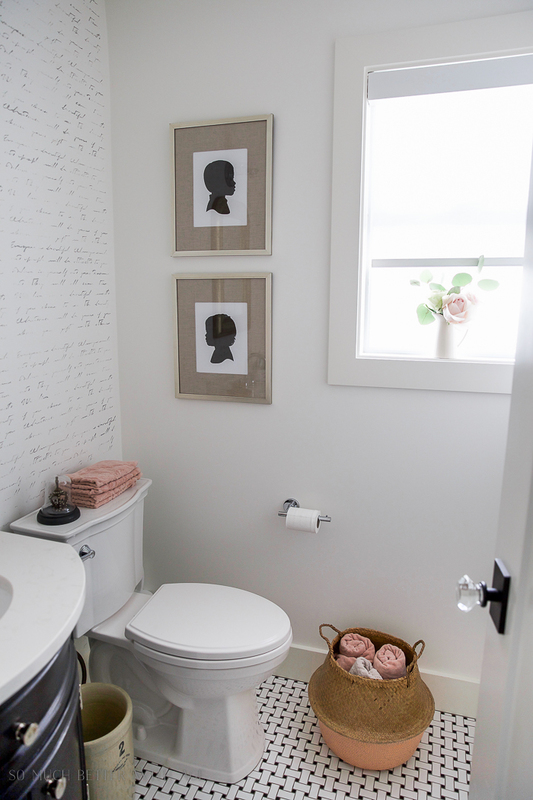 Your powder room is so pretty! I love the stencil wall and the silhouette pictures, every detail! So beautiful! That wallpaper is divine Jamie! This is stunning. 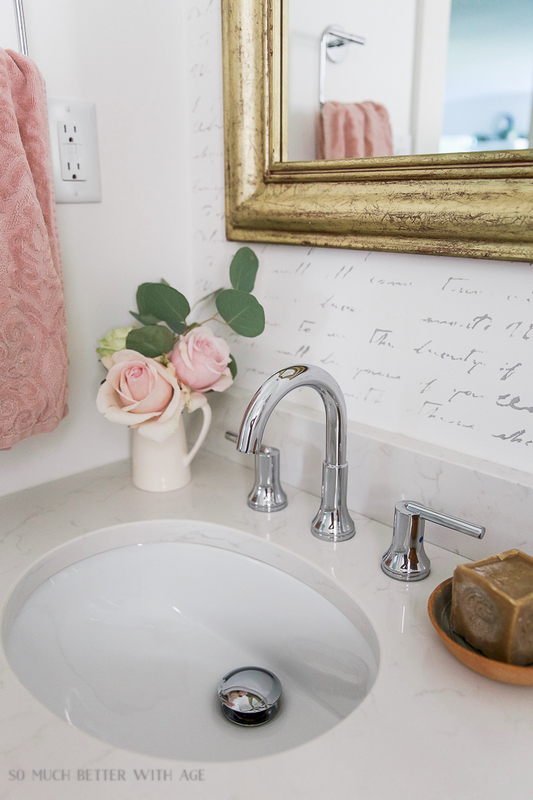 I love the stencil you used on that wall and might consider it for a bathroom wall we have. Thank you for sharing this with Share Your Style. I’m letting you know I’ve pinned this. Hope to see what else you might link up to our party! Absolutely stunning and the stencil wall is AMAZING.. Looks like something out of House Beautiful…….which your house is. Your attention to the little details really shows. I just love your blog and glad to have found you! !